The Corporate Purpose Statement of Chick-fil-A has become one of the best known in the world. Since the first restaurant opened its doors nearly 50 years ago, Chick-fil-A has grown from one man’s vision to one of the largest family-owned businesses in the United States. In the photo, from left to right: Armando Del Bosque, Steve Rubado (Program Manager, Lifeshape), Roberto Sanchez-Mejorada, Larry Cox (President & CEO of Lifeshape), Peter Freissle, Scott Holste (Director of Strategic Initiatives, Lifeshape), and Doug Hunter. 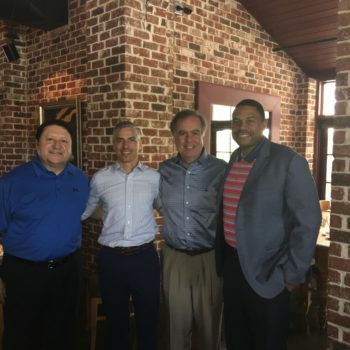 On May 3, 2017, Peter Freissle, Armando Del Bosque, Roberto Sanchez Mejorada and Doug Hunter began a new relationship between the Chick-fil-A (CFA) organization and His Way At Work by meeting with the leadership team of Lifeshape. Lifeshape is a non-profit, operating ministry developed by CFA “to glorify God by breaking the cycle of spiritual poverty.” After a day of discerning how God wants HWAW and Lifeshape serve each other to better serve the Lord, the two teams came away with several specific next steps that will allow us to explore possibilities for a long-term relationship that will support CFA’s Purpose Statement while enhancing HWAW’s ability “To inspire and help Business Leaders to improve their workplace by having God at the center and caring for people as He does to create Eternal Value“.